Ronald Rene Mitchell of Dutton passed away in his 79th year. [May 4 1940- August 28, 2018] Dearly loved husband of Marilyn [Learn] for 57 years.. Dear father of Denise Noddin [Stacia Lett], Rodney, Scott [Patti] Mitchell, Dutton, Cindy Mason, London, Pam Silva [Mitchell], Dutton. Loved by his Grandchildren, Melanie Mason, Collin Mason, Erica [Robert] Koscik [Silva], Blair Noddin [Sara Mitchell], Stephanie [Ryan]McQueen, Jake Mitchell, Chris Mason, Charlotte [Kelly]MacGregor.Special Great Grandpa to Gavin Flannigan, Kali Bancroft, Breanna and Anthony Mason, Gabi , Averie and Bryce Mitchell, Raymond and Faith Noddin, Eli and Liam MacQueen . Ron is survived by his sister Bonnie DeRyk [Frank], Sister in law Rosemary [Dave] Goble and Brother in law Gord [Norma] Learn . Survived by many nieces and nephews. Predeceased by his parents Clarence and Lily belle [Goodman] Mitchell. Ron spent 32 years working as an officer for the Ontario Provincial Police, finishing up his career in Dutton/ Elgin County. 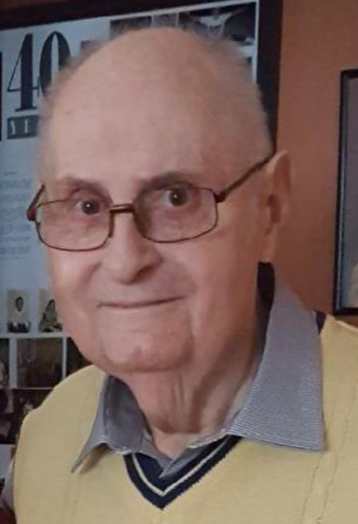 Relatives and friends will be received at Arn Funeral Home, 193 Shackleton St, Dutton [519-762-2416] Thursday August 30, 2-4 and 7-9 pm where the funeral service will be held on Friday August 31, 2018 at 11:00 a.m. Private family interment in Aylmer Cemetery at a later date. Donations to the Dutton Dunwich United Church greatly appreciated.